The main aim of Quantum Project was to create a browser engine which smoothly runs on any modern device. Project Quantum was announced on October 2016. 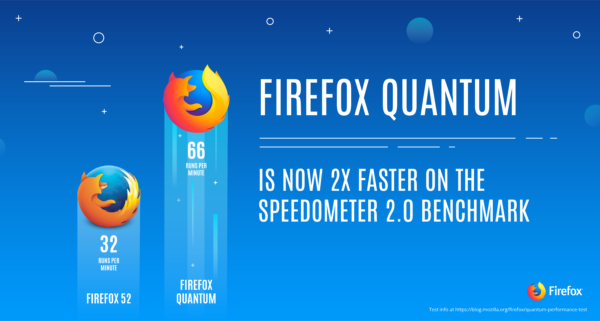 It took almost a year to develop Firefox Quantum. In between, Mozilla released Firefox Quantum Beta, Developer Edition in September. 2x Faster: Modern devices have more than one core CPUs. Quantum takes full advantage of all cores which makes it faster than never before. 30% lighter than Chrome: Chrome uses a separate content process and engine for each website instance, but Firefox reuses processes and engines to limit memory usage. Smooth browsing: With modern browser engine it makes easier to switch between tabs smoothly. The new design has square tabs, smooth animations, and a library, which provides quick access to saved stuff. Screenshots: Take and share screenshots directly from firefox. By default, online firefox screenshots are saved for 14 days, but if you click on the expiry date, you have the option to change this. Pocket: Pocket is previously known as Read It Later. It is an application and service for managing a reading list of articles from the Internet. Gaming & VR: Firefox has built-in support for WASM and WebVR. No additional installation needed. Library: All favorite contents will at one place like Pocket saves, bookmarks, browsing history, screenshots and downloads. It took a full year to create a Firefox Quantum. From development perspective: 75,342 files changed, 4,888,199 lines were added and 6,886,199 lines were changed. 6,000 web extension are listed and over 70% of add-on users already have at least one installed. 369 bugs targeted specifically at performance and responsiveness. 1,190 software bugs for the user experience. More than 700 authors contributed code to Firefox since August 6th release. 80 contributors from all over the world contributed to code development. The new Firefox has 7 animations viz. stop-reload, Pocket expansion, bookmarking burst, Pocket library drop, bookmarking library drop, downloading, pin to overflow.